The Billabong Girls Get Out There will conclude their 3 week- long summer tour with two highly anticipated back-to-back events in Cape Town. Muizenberg will host the first of two action packed events on Tuesday 21 December, immediately followed up with one final activation at Cape Town’s famed Camps Bay on Wednesday 22nd December. The three week long summer tour kicked off in fine style on Ballito’s Willard Beach last Saturday 11th December and was followed up the next day (Sunday 12th December) at Durban’s Suncoast Beach. It was then the turn of the South Coast holiday town of Margate to deliver a hugely successful conclusion to the KZN leg with the third activation on a sun-soaked, jam-packed Margate main beach. After heavy rain unfortunately enforced the cancellation of the Port Elizabeth’s activation, the Billabong Girls Get Out There Summer tour redeemed the garden route crowds with two sun-soaked events in the bustling holiday towns of Plettenberg Bay and Mossel Bay respectively. All eyes are now on Cape Town as the Billabong Girls Get Out There prepares to wrap up the summer roadshow after almost three weeks touring the country’s coastline. Starting at 10am and wrapping up at 3pm, each event promises a fun-filled day for the entire family, with a primary ploy to get girls onto the beaches and experience the healthy, energizing Billabong lifestyle. Whether it’s free surfing lessons, art workshops, beach games, or give-aways; the Billabong Girls will spice up those long sunny beach days this Summer. Bevcan will be fronting the fun on their giant inflatable slide and chill out area, they’re also hosting a competition where anyone can win a uniquely designed surfboard at each event! Seventeen Magazine is focusing on all the things girls just love such as Hula hoop games; Twista; Celebrity Quiz, Bingo; UrbanScout sign ups; Pamper Corners as well as the Ava A-List girl search. A free creative corner is also available throughout the day, where girls can express their creative side with paints on canvas, beading and sand art. As if that’s not enough, Billabong, Seventeen, Sony, and Nixon will be giving away awesome prizes at each event so make sure you fill out as many entry forms as possible at the beach to stand the chance of winning. The day is all about fun with the Billabong beach DJ keeping the happy summer sounds coming your way while MC, Marius Roberts, will get you involved in games and activities with heaps of prizes to give away. So be sure to join the Billabong Girls Get Out There Summer tour at one of their remaining four FREE beach day activations as they travel the country’s coastline through the Garden Route and on to Cape Town. Using Sony Bloggie’s, daily photographs will be uploaded onto www.billabong.com. Thanks to Bevcan, 8.ta, Seventeen, Sony, Von Zipper and Nixon, who have all contributed to making this the coolest beach activation this summer. Monday 20 December 2010 – Jordy Smith has ended the 2010 ASP World tour Season ranked No. 2, the best result by a South African surfer since 1977 World Champion Shaun Tomson finished second in 1984. Smith won his maiden event title at the Billabong Pro in Jeffreys Bay in July and also reached the final in two other events, finishing runner-up to Taj Burrow (AUS) in the season opening Quiksilver Pro on Australia’s Gold Coast and to newly crowned 10-time ASP World Champion Kelly Slater (USA) at the Rip Curl Pro Portugal in October. And the new approach really worked as a more relaxed Smith employed his patented aerial attack and futuristic manoeuvres to defeat the cream of the world’s top competitive surfers on a regular basis, only failing to reach the last eight once in the 10 events – when he was bundled out in the Round of 32 by wildcard Manoa Drollet at Teahupoo in Tahiti. His one victory, two seconds, six fifth place finishes and one 17th, plus a couple of good results in Prime and Star rated events, saw Smith amass US $235 150 (approximately R1.64 million) in prize-money in 2010, taking his career prize-money earnings to just over $526 000 and signing up a slew of new sponsorship deals along the way. Slater, 38, undeniably the best competitive surfer of all time, reached the final in six of the 10 events, winning four titles, and accumulated $416 000 in 2010, including a bonus of $100 000 for winning the ASP World Title. The other five event titles were won by Burrow, rookie Jadson Andre (a 20 year-old Brazilian whose father is two years younger than Slater! ), the late former three-time ASP World Champion Andy Irons (HAW), two-time and 2009 ASP World Champion Mick Fanning (AUS) and Jeremy Flores (FRA) who became the first European surfer to win an event in Hawaii by capturing the Billabong Pipeline Masters in memory of Andy Irons. The 2011 ASP World Tour will get underway with the Quiksilver Pro on Australia’s Gold Coast at the end of February. Jordy Smith will be the sole South African on the 2011 ASP World Tours after fellow Durbanite Travis Logie amongst the men and Rosanne Hodge and Nikita Robb (both East London) amongst the women all failed to finish inside the cut-off criteria for requalification. Logie, 31, did well to survive the mid-year cut from 44 to 34 on the ASP World Tour and was on the cusp of requalifying for 2011 through both the ASP World Title Rankings, where the top 22 automatically requalify, and on the ASP World Rankings, where the top 10 who have not already qualified via the World Tour rankings join the Dream Tour. However, following a Round 1 loss in the Pipe Masters, Logie ended the year ranked No. 29 on the World Title Race Rankings and even closer on the World Tour Rankings where his 36th place saw him end just 1 723 points (less than 1 750 earned for a 13th place finish) behind Dusty Payne (HAW) who grabbed the No. 32 and final qualifying spot. Hodge was the model of consistency in 2010, her fourth consecutive year on the ASP Women’s World Tour, reaching Round 3 in the first six events but not managing to advance to the quarterfinals, before placing 17th in the final event. She ended the year ranked No.13, significantly adrift of Rebecca Woods (AUS) who grabbed the 10th and final spot. Robb struggled to impress the judges in her rookie season at the highest level, only posting two heat tallies of over 10 out of 20 in 14 attempts, and bowed out with three 9ths, three 17ths and a 19th which gave her a yearend ranking of No. 15. The pair also finished well off the pace in the ASP Women’s Star rated series where the top 6 qualify for the following year’s top tier. Robb was the highest placed SA woman at No. 14 while Hodge ended her season ranked No. 22. Royden Bryson fared best of the South African campaigners in the Prime and Star rated events, ending the year ranked No. 76. The former East Londoner now living in Cape Town won the 6-Star rated O’Neill Cold Water Classic in Scotland and put himself into contention for the US $50 000 bonus for the five-event Col Water Classic Series title before missing the next two events in that series in Canada and Santa Cruz, California. Brandon Jackson (Durban North), who came within a whisker on qualifying for the 2010 ASP World Tour, was the only other SA surfer in the top 100, finishing at No. 100. Rudy Palmboom (Bluff) came in at No. 106 in his third campaign and Shaun Joubert, 19, from Mossel Bay, ended his first season at No. 118, achieving his objective of placing amongst the top 120 who are virtually guaranteed a start in all of next year’s Prime rated events. PIPELINE, Oahu/Hawaii (Thursday, December 16, 2010) – Jeremy Flores (FRA) 22, won the Billabong Pipe Masters in memory of Andy Irons over Kieren Perrow (AUS), 33, in a come-from-behind victory in firing four-to-six foot (1.5 metre) backdoor barrels, marking his first career ASP World Tour victory. 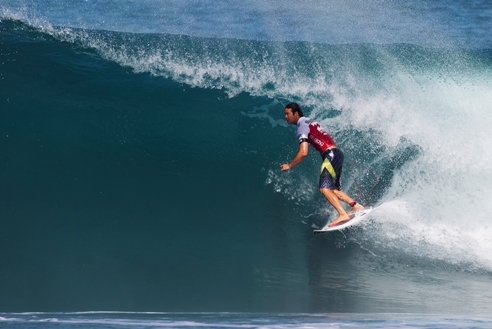 Joel Parkinson (AUS), 29, was another to stand atop the Billabong Pipe Masters podium, clinching his third, consecutive Vans Triple Crown title to conclude the 2010 ASP World Tour season. Flores, who was in need of a solid 8.60 single-wave score in the dying moments, clawed his way back into the Final against Perrow and threaded the needle on a beautiful righthand barrel to earn a 9.37. Making history as the first European to ever win the Billabong Pipe Masters in the event’s 40 year history, Flores punctuated his season with his career-best result. Flores’ impressive showing in the Final wasn’t his only come-from-behind win of the day, as the young Frenchman also topped reigning 10-time ASP World Champion Kelly Slater (USA), 38, in the dying minutes of their Semifinals match-up, marking a significant turnaround in the young Frenchman’s career. Flores Finished at No. 9 on the ASP World Tour Rankings for 2010. Perrow dominated the tricky Backdoor Pipeline conditions throughout the event’s entirety, weaving through several tight barrels to drop some of the event’s top scores including a 9.90 a 9.83 and a 9.70, However the hard-charging Australian saw his Billabong Pipe Masters title slip from his grasp in the final minutes of his match up against Flores. Kelly Slater (USA), 38, reigning ten-time ASP World Champion, appeared to be the form surfer of the event, notching the event’s only perfect 10-point ride in his Round 4 heat, but made an uncharacteristic priority mistake in his Semifinals bout against Flores, allowing the young Frenchman to find the score needed to overtake Slater in the final minutes of their heat to leave the Floridian icon with a 3rd place finish overall. The 2010 Billabong Pipe Masters in Memory of Andy Irons also represents Slater’s historic 20th event at the Banzai Pipeline and the ASP World Tour veteran took the time to reflect on his many years in Hawaii. Dane Reynolds (USA), 25, was another talent to shine in the racy Backdoor Pipeline conditions. The innovative natural-footer topped fellow Americans Taylor Knox (USA), 39, Damien Hobgood (USA), 31, and Patrick Gudauskas (USA), 25, but fell to Perrow in the Semifinals to match his best result of the 2010 ASP World Tour season with an equal 3rd place finish. Joel Parkinson returned to Hawaii to defend his Vans Triple Crown title after a brutal laceration to his foot sidelined him for nearly the entire 2010 ASP World Tour season. The stylish natural-footer put on a memorable performance despite the injury, posting a victory at the ASP PRIME Reef Hawaiian Pro, a 9th at the O’Neill World Cup at Sunset Beach and a 13th at the Billabong Pipe Masters to secure his third consecutive Vans Triple Crown Title.